Gym memberships aren’t always a viable option for people on tight incomes, but these guys are living proof it is possible to become ripped without such spending. Meet Sekou and Alseny, two West Africans who have sculpted their bodies using nothing but a balanced diet, resistance exercises, and some impressive tumbling skills. 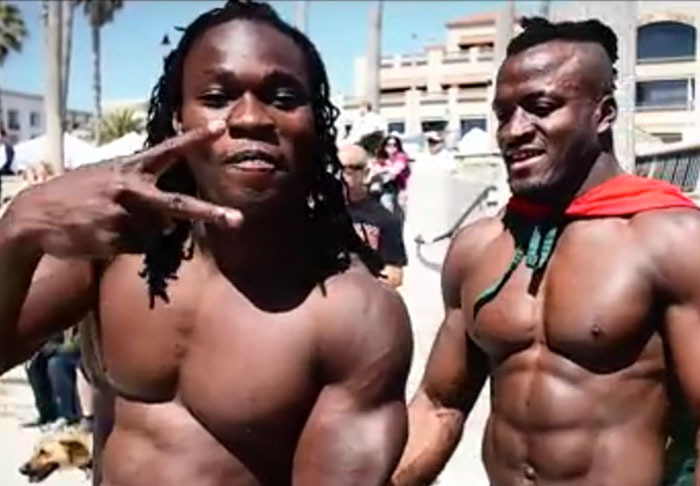 The pair, who hail from Guinea, revealed in an interview with the Strength Project a few of the secrets behind their awesome physiques. No we don’t, just push ups and pull ups. We do our strength work from the circus, so we do a lot of stuff like bboy to get natural muscle. But for weights, we use people and lift each other for our job. They added they only consume natural foods, gaining their protein exclusively from chicken and fish as opposed to using supplements. It probably isn’t as hard convincing yourself to engage in some free public fitness when you have Huntington Beach as your backdrop. If only Blackpool or Skeggy were so picturesque.